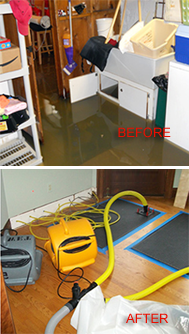 The best flood cleanup company in Wayne, Oakland & Macomb County! When your home is inundated with water or sewage from a flood, Aaron’s Restoration is prepared to react immediately in order to minimize damage to property and restore your home. We are are on-call 24/7 – because we know that fast flood cleanup is necessary to prevent secondary water damage, including: mold, fungi, bacteria or other microbial contamination. We not only remove visible flood water from your basement or home, we also address unseen flood problems such as any water seeping into the carpet, foundation, walls, and other structural areas. Fans or “air drying” are not rapid enough to prevent bacteria and mold from invading after a flood. We use state-of-the-art equipment to rapidly dry your flooded home or business. We have the powerful pumping methods and vacuum equipment needed to remove every drop of water from all flooring, walls, furniture and structures. 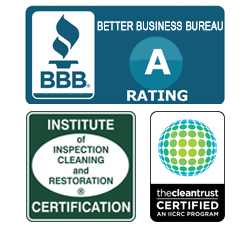 Our experienced water damage technicians are fully trained and certified by the Institute of Inspection, Cleaning and Restoration Certification (IICRC). Our flood cleanup team is dedicated to putting your home or business back to its original condition as quickly as possible, while ensuring the work is done thoroughly and completely. If you have experienced a flood in Oakland, Wayne or Macomb County, we are here to provide flood cleanup 24/7. We will rapidly clean up the flood damage – and also help you identify the cause of the flooding so that we can also help you prevent future flood cleanup!